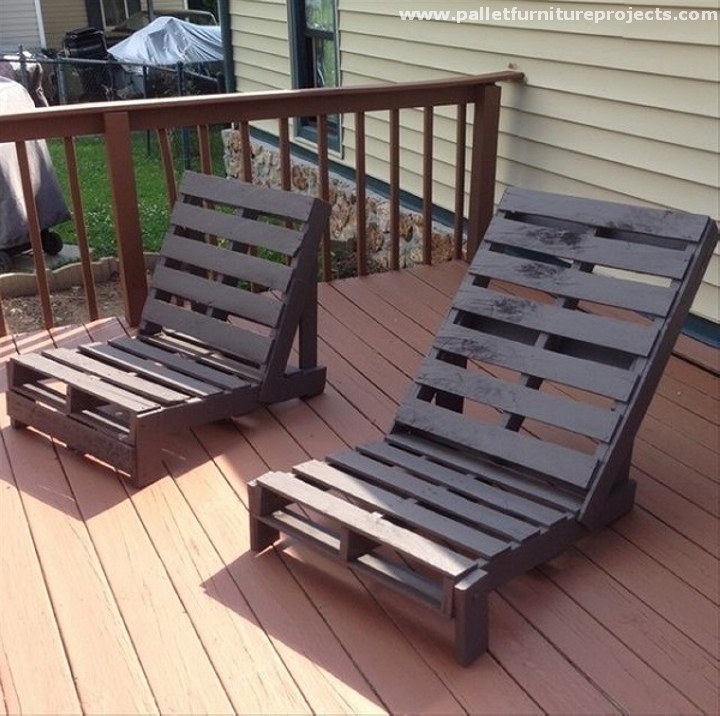 After the successful completion of a number of wooden pallet recycled furniture ideas, we have had a threshold from the subscribers to come up with some pool chairs or easy chairs for enjoying the sunlight. Now realizing the demand, one thing we were sure about was that the said chairs or daybed sort of stuff is supposed to be large, and they also have to be pretty comfortable to provide us with some quality outdoor time. 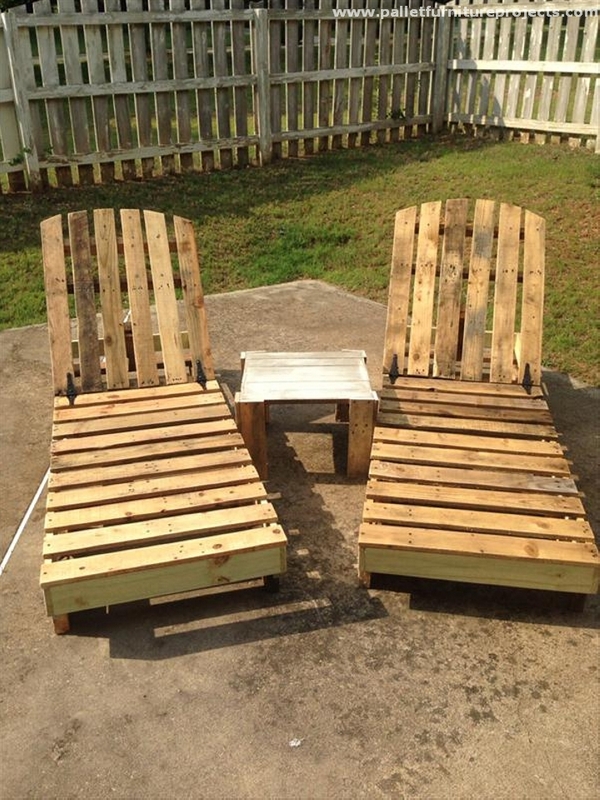 Keeping in view the entire demand list, here are some genius pallet wood sun lounger ideas. The loungers that are especially designed to be placed outside and make you pretty comfortable. 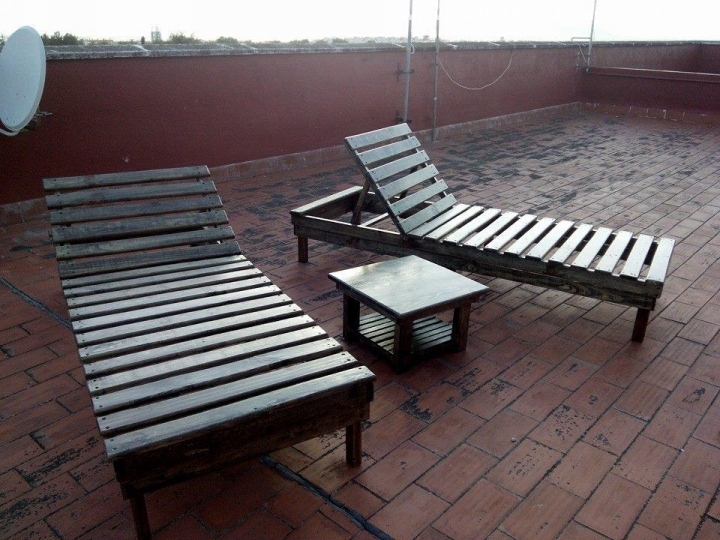 Let us begin with these vintage sun loungers. 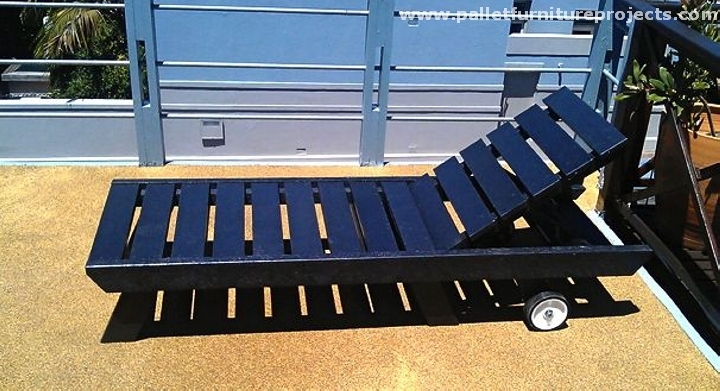 They can be called portable wooden pallet sun loungers as one part of them can be lifted upward with a support of wooden plank. That would turn to be the back of the sun lounger to give you a perfect posture. 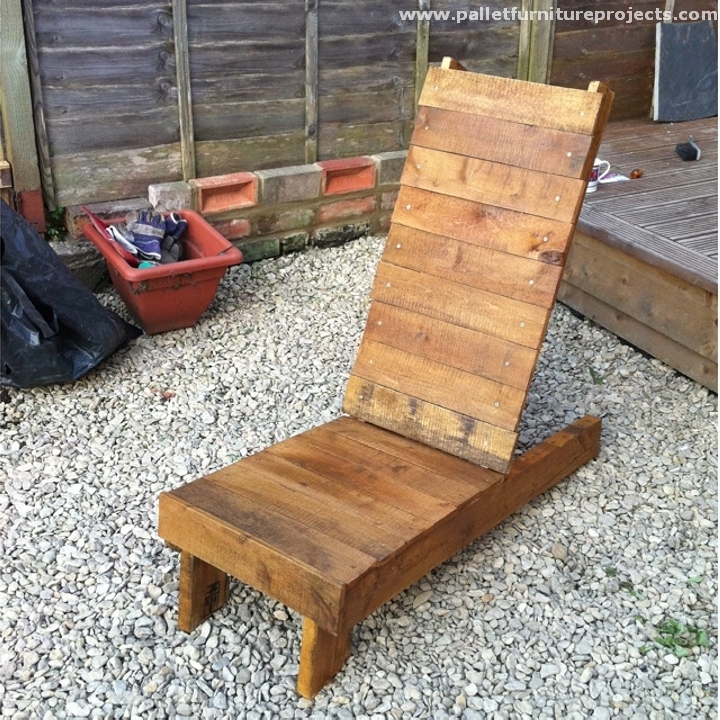 Coming towards the next project, here is a rustic wood pallet upcycled pair of sun loungers. We have kept them unstained, we just did some minor sanding to smoothen up the texture and we placed them on the site. So a simple project to recycle. From a distant look, this would look like a rustic wooden bed along with a portable headboard. 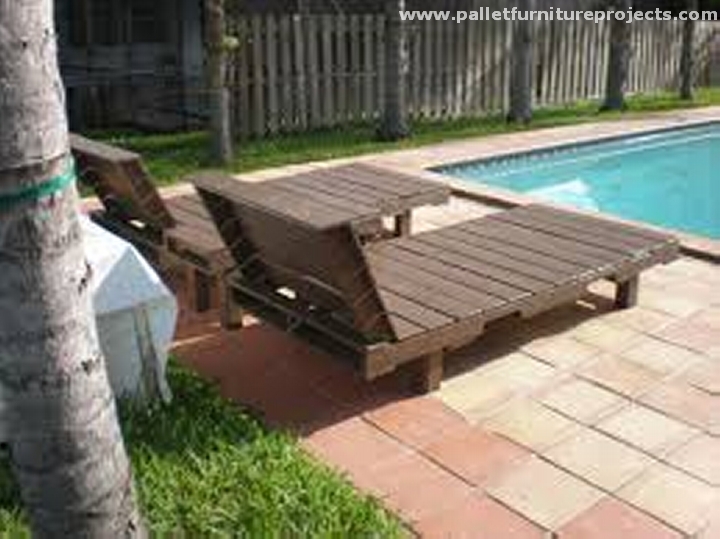 But this is actually made with the pure intent to be placed outdoor as a wooden pallet sun longer. 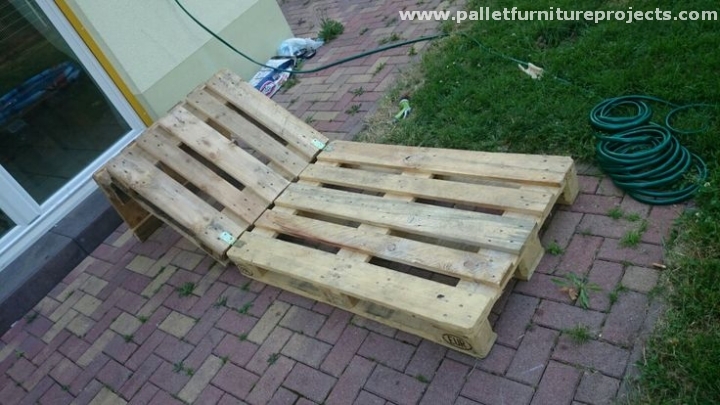 Despite of the worst condition of the pallet planks, this still makes an ideal sun lounger. How many of you have worked on some wooden Adirondack shaped chairs in some of our earlier projects? I think many of you have tried this and shared the projects with us. 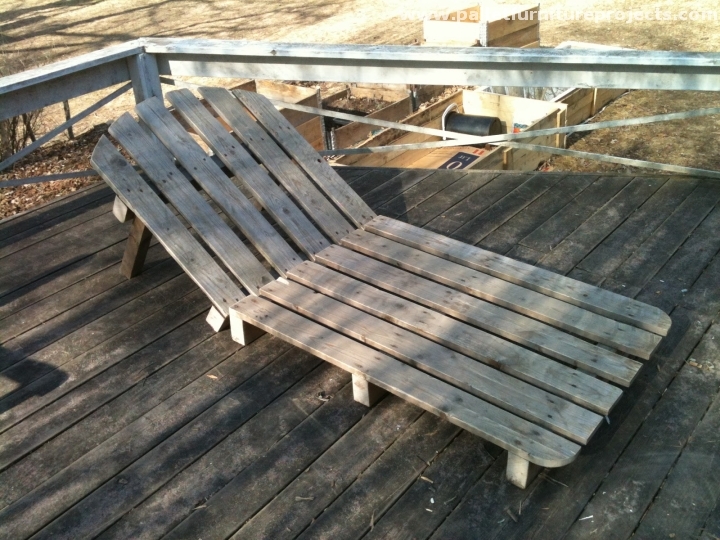 The same inspiration is applied here again and recycled a decent pallet wood lounger. 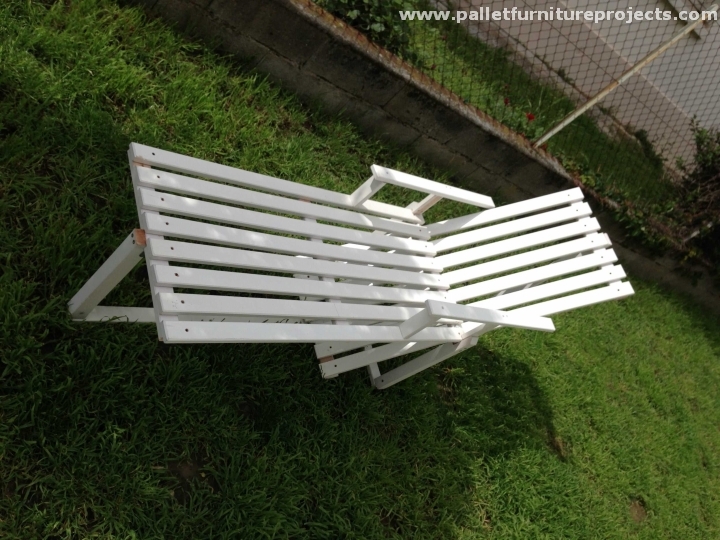 Ok, have you got a large swimming pool inside you grand lavish house or in your country side farm house and you are looking for some multi purposed chairs that could also be used as wooden pallet sun loungers? Have a look on this cute pair, this would do a great job inside your house. 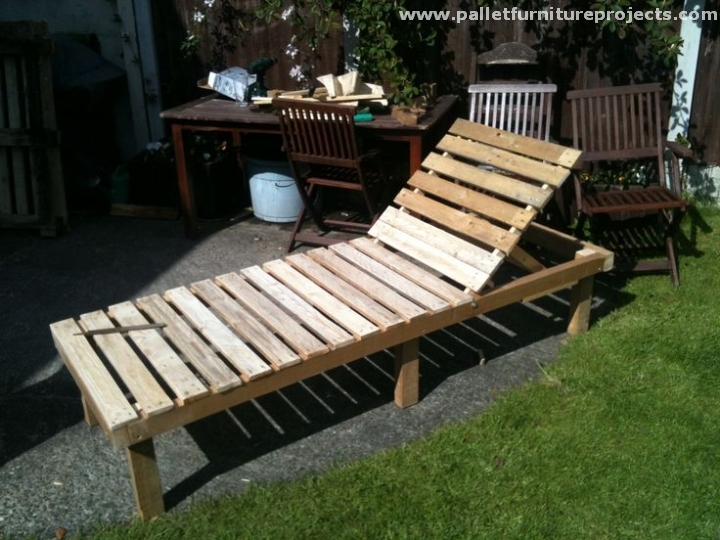 Here is another classic wood pallet recycled sun lounger that is portable. Its portability would allow you the maximum ease and comfort. This is basically made in two units, one is for the back and the other one is for head lift that can be erected with some support. Sometimes you feel like spending a lot of time in your garden or patio to enjoy the direct sunlight. In this sort of situation a regular sofa or couch wouldn’t at all be a great choice. 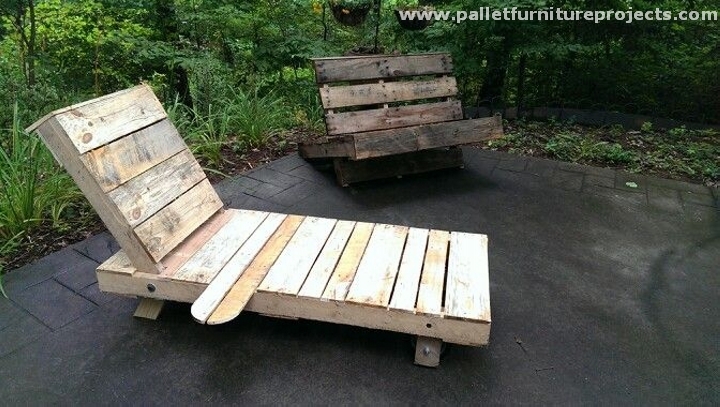 Recycle this sort of wooden chair or sun lounger to sit outside in the sunlight and enjoy the moments. 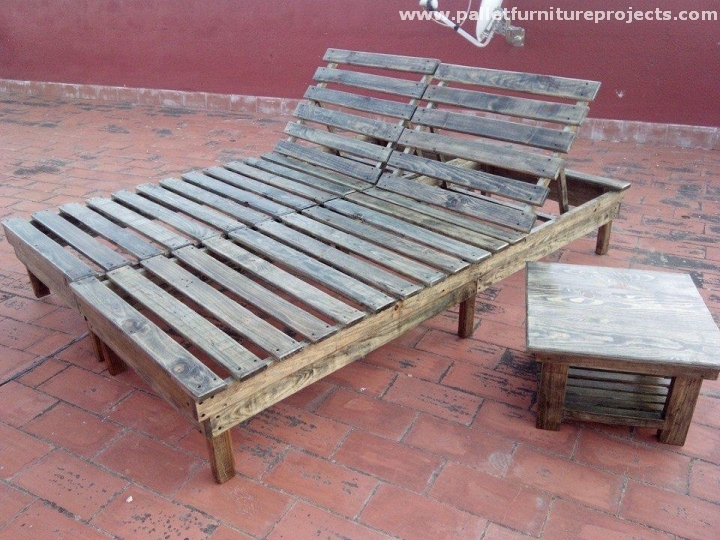 Now this is something irresistibly great, this is a perfect wooden pallet repurposed sun lounger from every perspective. Color, design and shape, each aspect is taken the best care of. Plus the built in wheels would allow you to drag it wherever the sunlight goes. I would go to any extent to get this recycled sun lounger. 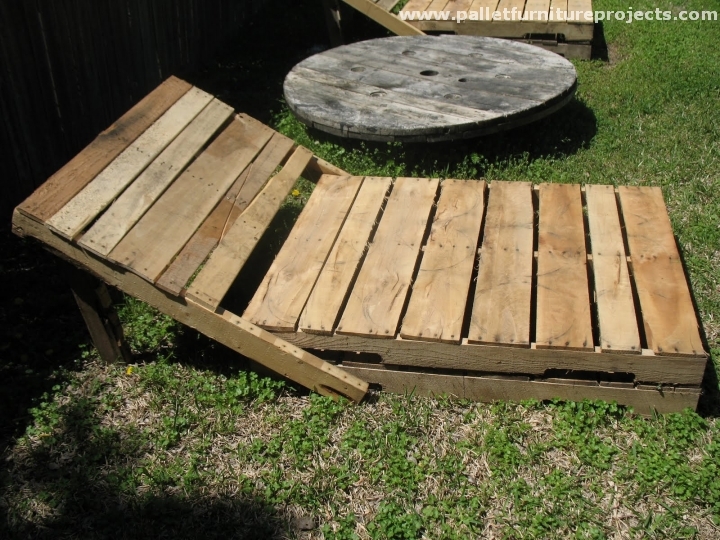 This can easily be called a real master piece of pallet wood recycling. Provided with all the necessary infact some cool additional features, made by some true crafter who is very well versed in the exploitation of the shipping pallets. 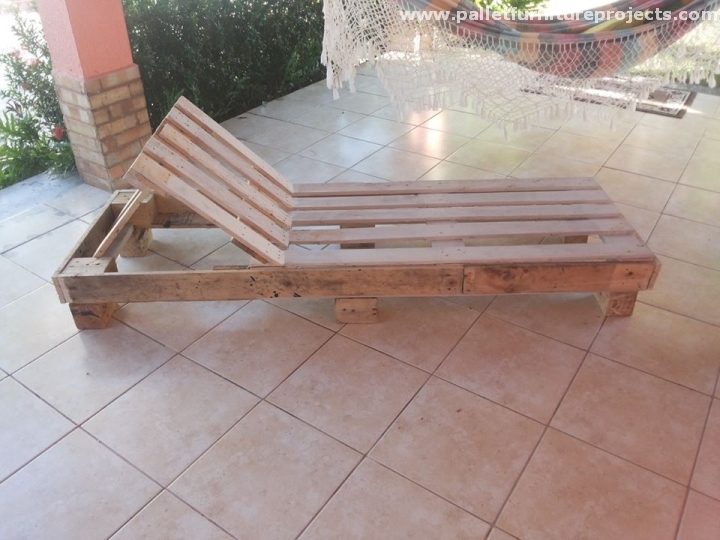 What exactly we are doing in recycling this range of pallet wood sun loungers is that just with a some slighter modifications we are making different articles that can perfectly be used for the same cause, even some of them are multi purposed due to their certain shape and appearance. 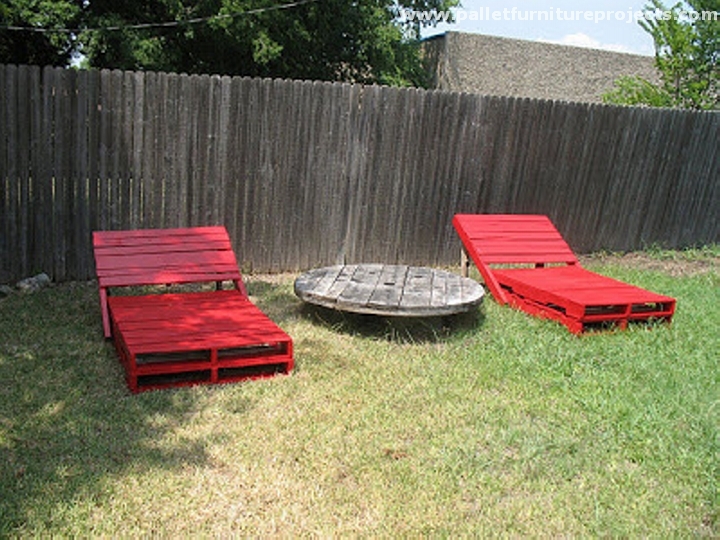 Even if you want to make one for your patio with the lowest budget, you can simply grab a couple of shipping pallets. 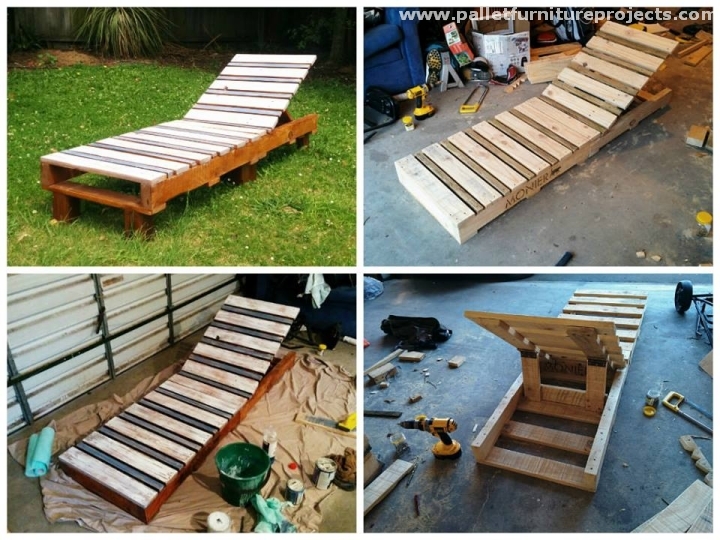 Dis assemble them first, spare some time for the sanding, use a staple gun a recycle a simple and decent pallet wood sun lounger for yourself. 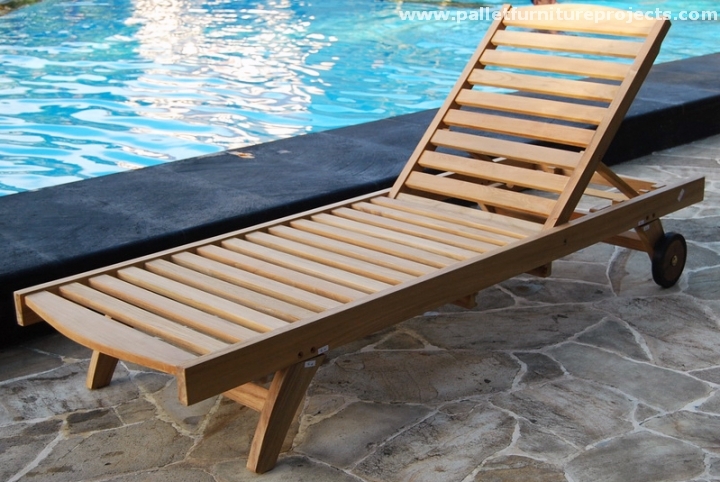 Can anyone of you tell what different feature or component is displayed in this pallet wood sun lounger? I am sure some smart pallet crafters can figure this out so easily. 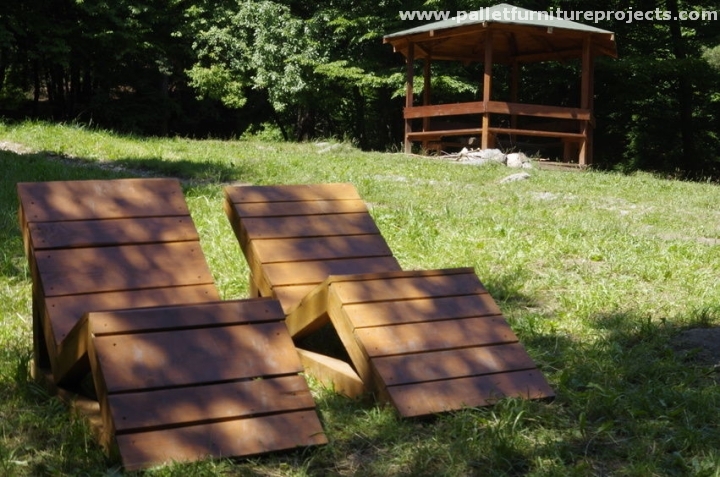 We have used a pair of recycled skis in this wooden sun lounger that can easily be seen. If you are going to recycle one for your terrace, keep the back a bit higher than the others we have recycled so far. This would be a sort of settlement in the congested area that you are left with in your terrace, and would again give you an ideal posture to enjoy the sunlight. If we compare, there is just a minor difference in the sun lounger and a pool chair. Infact in a few articles we can hardly figure out the difference. 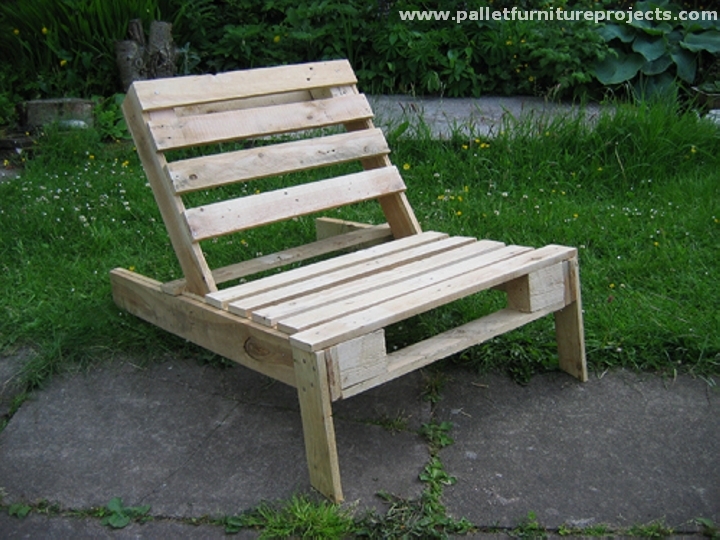 And in pallet wood recycling, this is all about your desire and ease. Shape them according to your will neglecting the stereotypes. 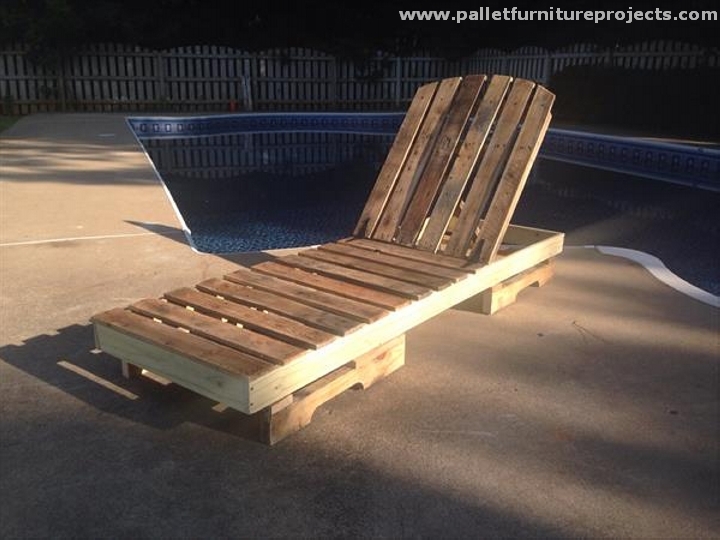 Wow, a grand shipping pallet repurposed sun lounger. 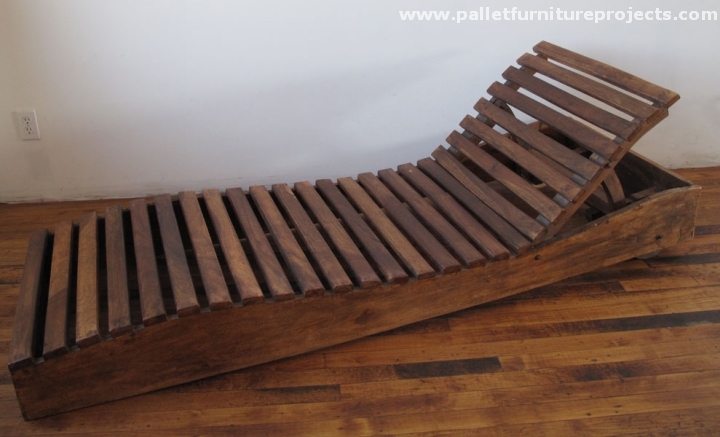 Made with some deteriorated and broken shipping pallets, this is provided with a perfect design giving it a perfect look. And the portability of the lounger has even escalated the beauty of the lounger. 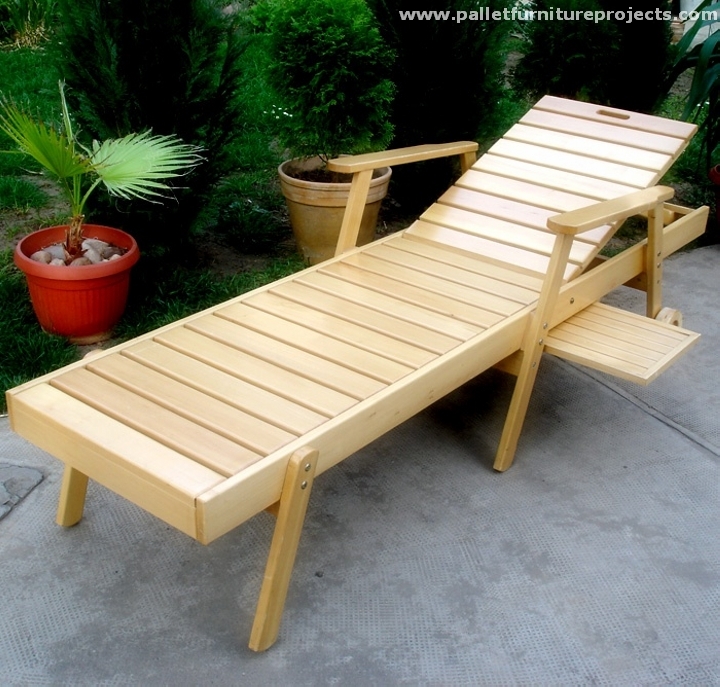 Now what about this sleek and stylish wooden pallet sun lounger? I think this has got a decent design and shape, the bright white stain is pretty perfect, the lower frame despite of single liner support is still reliable. While the fixed back is a blend of ease and comfort in the wooden article. I think you guys have had enough of smart sun lounger ideas in this article already but wait, we are not yet done. 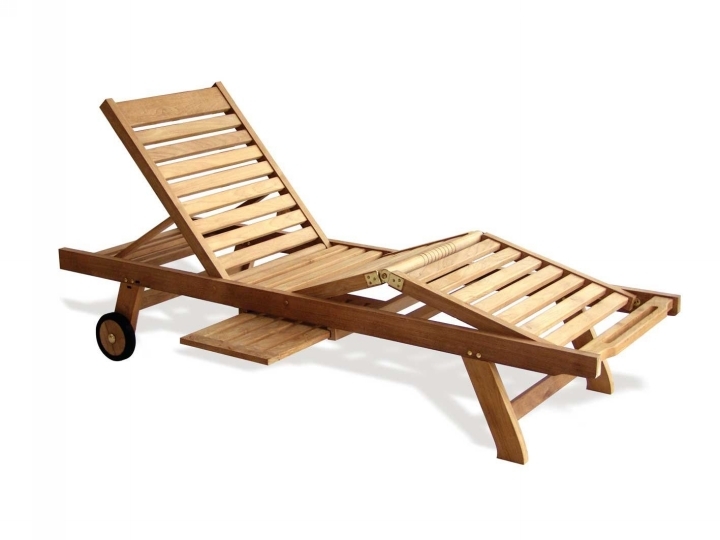 Here is a lounger that is pretty close to some market based lounger designs. Wheels on the rear, and wooden legs on the front is a sort of charmer. 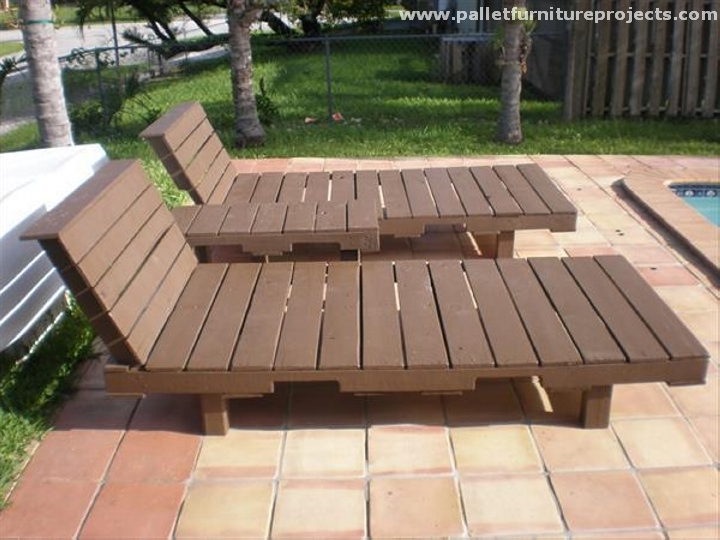 Closing the lounger range with this pair of most comfortable and decent wooden pallet recycled sun loungers would make us feel like we have done a really impressive job by presenting you guys a number of classic lounger ideas. You can easily make the pick of yours.